Does anybody actually enjoy travel packing? I can’t say I’m over-the-moon about having to do it, but I can say that after 10 years on the road, I’ve become pretty darn good at it. This month’s reader question was like music to my ears! You’re right. If I didn’t pack smartly, I wouldn’t be able to travel with half the stuff that I do. And given that just about everything I own fits into a bag that I travel full-time with, I’m pretty accomplished at the packing process. So, thanks for asking! Here are 13 travel packing tools and tips to help you travel like a pro. (Stick around to the end of this post to see a video of me using most of these tools to pack up my crap in record time)! I love my packing tools. Like, really really. Although I may not particularly appreciate the act of packing up all my stuff (let’s face it: packing is a drag), I certainly do appreciate being able to fit everything in my bag and have it all organized on arrival. 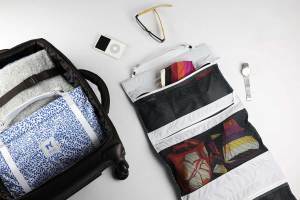 When it comes to packing tools, the main way to save space in your luggage is to compress stuff, and the most logical way to do this is with a compression sack. 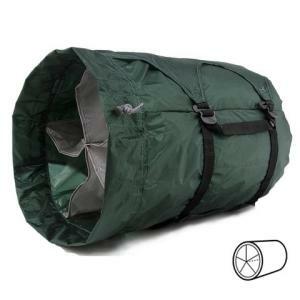 A compression sack is a fairly simple sack (often made of ripstop nylon or a similar ultralight material) with straps and buckles on the sides that allow you to cinch the contents down to a fraction of their original size. This compression sack pictured above is from GobiGear, and has the added perk of being segmented for additional organizational benefits. I’ve also been experimenting with compression bags (pictured above) recently, since I have been travelling to places with cooler climates that require thicker clothes which take up a lot of space. These compressions bags from Eagle Creek did a charm with my jackets and sweaters. You simply put your clothing in the bag, zip it closed, and roll it to get all the air out through the bag’s one-way vents. 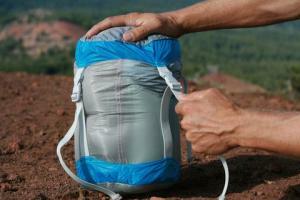 Packing Cubes top most travellers’ lists of organizational packing tools. I too, am among the ranks who have used – and love – packing cubes. 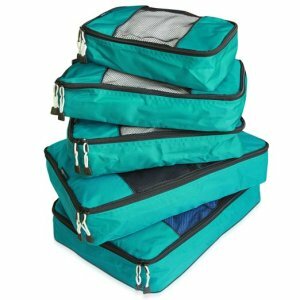 For added value, I like packing cubes that can also expand/compress to save more space with an extra zipper; it works similar to expandable luggage. Another organizational packing tool that I enjoy using is called the TUO, by Origami Unicorn. With mesh dividers and a variety of small pockets, the TUO is intended for small items like socks, underwear, belts, ties, etc. 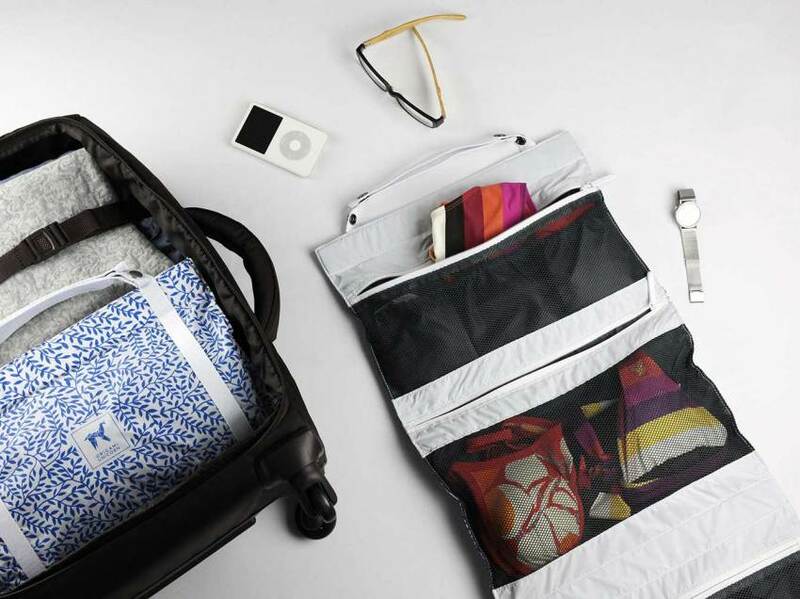 Everything has its place in the nicely folded-up TUO, and when you arrive at your destination you can unfold it and use the snappy straps to hang it anywhere. Personally, I don’t use the TUO for socks and underwear, since such items are oh-so-compressible, and the TUO doesn’t do much to save space. But for me, the TUO makes a fabulous toiletry organizer, and accompanies me on checked luggage and carry-on trips alike. I also want to put a good word in for the pure and simple Ziploc Bag. I have an assortment of these in different sizes at all times. They’re great for protecting toiletries from leaking/spilling into other parts of your bag, for organizing trinkets, storing dirty laundry, and even for washing said dirty laundry! The many applications of a Ziploc Bag are only as limited as your imagination. I’ve been using the HoboRoll for years, and for me it’s an absolute must-have. The segmented compartments of this cylindrical miracle-worker allow me to organize all my socks, underwear, workout gear, scarves, hats/gloves, and more. Then, it closes up and compresses down to save space while I’m on the move. When I arrive at my destination, I actually continue to use the HoboRoll (uncompressed) as an organizational tool. The ROLO has been part of my entourage for about a year, and it’s a keeper. 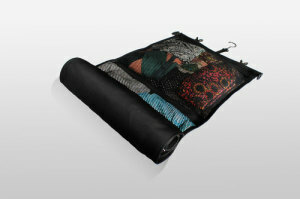 You put your clothes in the various zippered mesh pockets, roll it up, and use the compression straps to keep it small. When you arrive, just unroll your ROLO, hang it up, and you’re unpacked! If you’re on a trip that has you moving around a lot, this puppy makes the packing/unpacking process a breeze. However, if you’re down to the wire on luggage weight and space, you might not be able to use the ROLO, whose weight/space-saving superpowers are somewhat mitigated by the durable make and material. But I’ve taken it on quite a few carry-on trips and it has worked a charm. Packing tools will only get you so far; technique is what makes the difference. Here are some tips to help you save space, stay organized, and even stay fresh along the way. This is especially important if you have rolling luggage that likes to topple over when left standing. Make sure you put your heaviest items at the bottom and back of your luggage for optimal distribution. Have you ever seen the puzzle of how to get a bunch of stones and sand into a glass vase that doesn’t quite seem big enough? The trick is in putting the big stones in first, and letting the sand work its way into the spaces in between. The same principle applies to packing. Place the big stuff in your bag, then feel around for extra space, and stuff smaller items into these spaces. 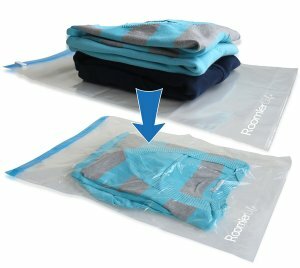 If you’re not using something like the ROLO or packing cubes for clothing, then roll each piece of clothing individually and use them for this purpose. If space is tight this packing technique will make the difference between fitting everything in, or not. Shoes are huge space-wasters – unless they’re totally collapsible, or filled with something. So stuff your shoes with miscellaneous items; it’s also a good way to protect somewhat delicate items. If your shoes, laundry, or anything else has an unsavoury travel-stench, it’s nothing a dryer sheet can’t fix. Keep a few of these in a Ziploc Bag (see? There’s another use for them) and take them out one sheet (or even half) at a time to place wherever it’s most needed. There’s nothing like an exploded liquid in your bag to put a damper (pun intended) on your arrival. In addition to keeping my liquids in separate Ziploc bags, I also use this trick which makes a spill almost impossible: unscrew the cap and put a piece of cling film or plastic over the opening. Then screw the top back on, and rest assured that your liquids won’t be going anywhere, except to your destination in one piece. Protect breakables by wrapping them in scarves or hats, or as Nick and Dariece suggest here: a bottle of wine gets its best protection sandwiched in a pair of hiking boots! Want to See Me Pack? Would you like to see some of these packing tools in action, and to learn more about my packing strategies? Even better, do you want to see me pack all my crap up in record time? Check out this video below! Not sure what luggage is best for you? Take this fun quiz and find out which luggage best suits your travel criteria and personality. 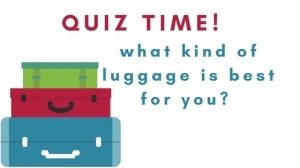 QUIZ: What kind of luggage is best for you? I enjoy packing because it means I’m going somewhere. It’s the unpacking I loathe 😉 Great tools and tips Nora! Don't subscribe All Replies to my comments Notify me of followup comments via e-mail. You can also <a href='https://www.creditwalk.ca/comment-subscriptions/?srp=5004&srk=2648578ecea05c83754707575dc5a494&sra=s&srsrc=f'>subscribe</a> without commenting.